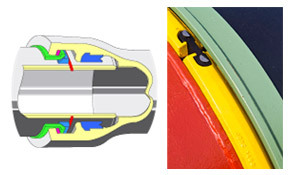 The PAMLOCK (Pk) joint is a STANDARD joint equipped with an anchoring system especially designed for large diameters. The novelty of the system lies in the use of shot particles,which hold the joint together without recourse to bolts. The anchorage takes up the axial forces and allows concrete anchor blocks to be dispensed with. The basic principle of joint anchoring consists of transferring the axial forces from one pipeline component to the next, thus rendering joint separation impossible. Anchored joints allow the axial thrusts arising at particular points (bends, tapers, tees, blank flanges) to be distributed over one or more pipes, thus avoiding construction of concrete anchor blocks. The seal is provided by a STANDARD joint gasket. - a device known as a conformator, which transmits the axial force to the internal socket surface by means of shot filling the annular gap formed by the socket and conformator. - automatic stretching of the main on assembly. Any subsequent movement of the main during testing is consequently restricted to residual shot settlement. Pipes and fittings: DN 1400 to 1800. For DN 2000, please consult us. The ANCHORED PAMLOCK joint is of particular interest where congested conditions preclude the construction of anchor blocks, or in poorly cohesive soils. The ANCHORED PAMLOCK joint combines the advantages of flexible joint pipes with welded joint pipes. The leaktightness of the joint relies on the proven qualities of the push-in STANDARD joint. − 1° (pipe end displacement 14 cm), DN 1400 to 1600. ANCHORED PAMLOCK joint assembly is dealt with in a special leaflet. Please consult us.